Schizophrenia is a chronic and disabling mental disorder characterized by positive, negative and mood symptoms, disturbed coping abilities with elevated distress and a significant decline in cognition, quality of life and psychosocial functioning. About one-third of all patients with schizophrenia do not respond adequately to drug treatment. Today neuroscience and clinical research have sufficiently advanced to introduce a novel generation of compounds with neuroprotective properties. The use of neuroprotective agents in schizophrenia is not yet significantly established. An in-depth review of new compounds such as neurosteroids, estrogen, omega-3 fatty acids, S-adenosylmethionine, cannabinoids, piracetam, modafinil, L-theanine, bexarotene with neuroprotective properties is discussed. The mechanisms underlying the neuroprotective effects of these compounds vary and differ from classically defined dopamine and serotonin receptors. This review highlights selective evidence supporting a neuroprotective approach in the search for novel compounds, and suggests future directions for this exciting area. Neuroprotection strategy may be a useful paradigm for treatment of prodromal and first-episode schizophrenia patients and might have a significant impact on the subsequent course and outcome of the illness. 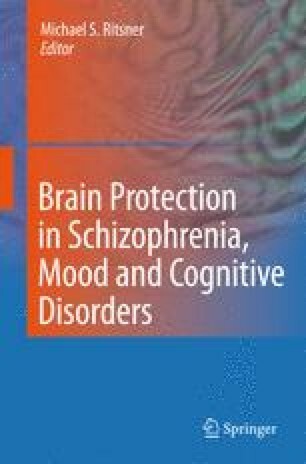 The clinical effects of neuroprotective agents clearly merit further investigation in schizophrenia spectrum disorders. The author would like to express gratitude to my colleagues Drs. Anatoly Gibel, Yael Ratner, Professor Vladimir Lerner, and Professor Abraham Weizman for fruitful cooperation. Mrs. Rena Kurs provided outstanding editorial assistance. The author gratefully acknowledges the support of the team of clinical departments of Shaar Menashe Mental Health Center. Clinical trials with neuroprotective compounds were supported by generous grants from the Stanley Foundation.